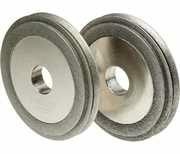 Resin Bonded Diamond Grinding Wheels - 75% concentration. Recommended for grinding carbide tipped or solid carbide milling cutters and lathe tools etc. as well as glass and ceramics.